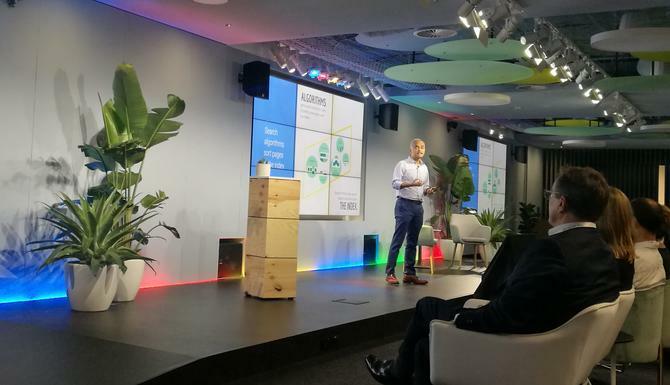 Speaking at today’s ‘Think with Google’ event in Sydney, the company’s fellow and global VP of search, Pandu Nayak, cautioned against too much transparency as part of a wider presentation on the future of search technology and artificial intelligence’s (AI) role. You only need to look at Google’s history to see this, Nayak said. “As search rankings became economically valuable, people started gaming the systems. Rather than building great services and content for their users, they started building systems that started gaming the algorithm to get users to do something else, some of which was malicious,” he said. An example came in 1999 after Google’s published a paper on page ranking rules which articulated the importance of links within Web pages. “Next thing you know there’s a cottage industry of spammers who are in the business of scamming links,” Nayak said. According to Google’s research across results with no spam protection, more than 40 per cent of Web documents included its index present spam across the Web. Its own mechanisms to combat this in have led to a 52 per cent reduction in the global spam rate in the last three years, he continued, removing approximately 50 billion impressions spammers would otherwise get through search. While these methods are not public, Nayak flagged Google’s published Quality Guidelines, a 160-page document, as an example of how the company aims to be transparent around what defines great search. As AI and further algorithms play a role in improving natural language search, transparency remains a fragile balance, he said. Another aspect that’s also important is transparency to users. “We already have some limited areas of transparency for example around advertising. Search itself is free; the reason for that we show ads on the search page. But search results are not paid for…and we clearly mark ads for ads,” Nayak said by way of example. Asked by the audience whether this lack of transparency makes Google too much of its own judge and jury, Nayak answered search results themselves are the best check and balance. And just like many other institutions, it’s the media and consumers keeping the company honest. “For example, two years ago, after the US elections, it was The Guardian that identified misinformation in our search results, around the holocaust. They didn’t need to look at her algorithm, they looked at search results, which are there for all to see. Unlike what most people think, search results are not heavily personalised, so we largely have a shared understanding as consumers of search. Location is the important thing, but other than that it is lightly personalised,” he said. “Our challenge is no one is actually saying ‘what is the problem?’. I’m not saying there aren’t problems. But those problems should manifest in search results. And they are available for anyone to analyse and then we can discuss it in the concreteness of a problem. Another key part of Nayak’s presentation was the transformative nature of voice-based search. Again, AI and deep learning are the driving forces here. To highlight just how far voice technology has come, Nayak ran a live demonstration of Google’s voice assistant, speaking in natural language and with an accent to ask questions about Australia and New Zealand’s prime ministers. This showcased not only advances in recognising voice, but also the contextual relevancy increasingly being introduced. But there’s still a way to go, and Nayak pointed out voice isn’t necessarily going to be the right solution for all contexts. “One challenge we have to address effectively before voice search overtakes traditional search is today’s voice interfaces focus on a single answer – and that’s appropriate when there is a single answer for something,” he said. “But there are many things people ask about that don’t have single answers. It’s naïve to think we can give single answers on such issues. There’s work to do to figure out which are the appropriate voice interfaces we can have that allows people to look at the nuances out there. Meanwhile, as AI further pervades all aspect of digital, Nayak has his Google team focused on better language understanding to provide more accuracy and contextual relevancy. This work also extends to machine translation from one language to another in order to present the best information to search users no matter where they are or what they’re looking for. Over the past year, Google undertook this with Indonesian and Nayak said it’s beginning to make progress through machine translation. “What if we could take your query, translate to English, get high quality content on your question, then translate it best to your target language? This would be amazingly useful for parts of the world where such high quality content doesn’t exist,” Nayak said. Overall, AI presents “genuinely powerful techniques” to grow and discover interesting patterns, and is becoming a key driver of further innovation, Nayak said. “These will allow us to advance search in ways that frankly you won’t notice – you’ll just know search became better,” he added.